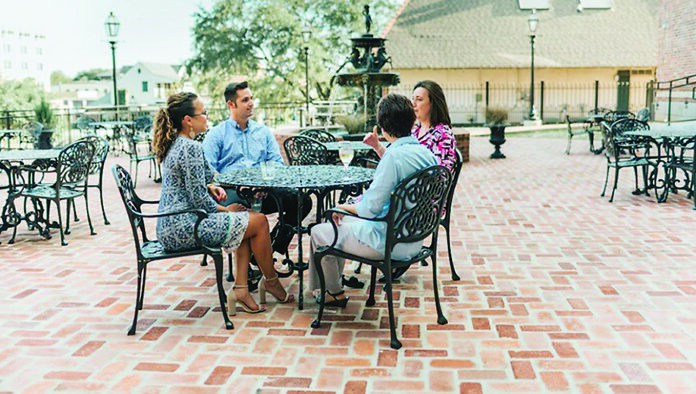 Photo by Rachel Leigh, used with permission by CSD Hotel The Courtyard at Chateau Saint Denis provides a relaxing space for convention attendees to take a break between meetings while soaking in the Natchitoches atmosphere. Natchitoches continues to be the “it” place for all things business and recreation. Natchitoches will host the Clerk of Courts Winter Meetings Nov. 28-30 and the La. Assessors Association Christmas party Dec. 4-5 at Chateau Saint Denis. Clerk of Court David Stamey said there were 110 attendees and about 55 parish clerks for their meetings sponsored by the Louisiana Clerk of Court Association. “Having mid-week meetings here really helps the merchants, restaurants, hotels and B&Bs,” Stamey said. Natchitoches Tax Assessor Dolly Mahoney said there will be 170 attending their annual Christmas party and meeting. Natchitoches Convention and Visitors Bureau Director Arlene Gould said they provided each guest with a welcome packet. “It’s a brown bag with our logo containing the Historic Natchitoches, a visitors guide, bookmark and the Christmas brochure. We want them to know we want them here,” she said.